Many products and internet sites promise a miracle cure for food allergy or food intolerance but many of their claims are not based on any solid evidence. The best thing to do if you think you have a food allergy or are intolerant to foods such as dairy or wheat, is to see a specialist who uses evidence. Consultant Gastroenterologist Ana Wilson offers expert food allergy testing, diagnosis and professional advice and treatment. The difference between an allergy and an intolerance? Many people think that food allergies and food intolerance are much the same thing, but in fact they are very different. An allergic reaction to food is a response by the immune system that comes on very quickly. It can be induced by even a trace quantity of the food. Food allergies can cause anaphylaxis, which is a life threatening reaction in the body. A severe nut allergy would fall into this category. A food intolerance is an inability to digest or process the food, often caused by a lack of the appropriate enzymes. The reaction usually requires a larger amount of the food and takes much longer to occur. Food intolerance usually causes digestive problems, such as bloating, abdominal cramps and diarrhoea. Although good allergy reactions are often more severe than intolerances, an allergic reaction may be mild, causing a short-lived rash for example, while the digestive reaction to an intolerance can be uncomfortable and even painful. Genuine food allergy is a rare condition, affecting between 2% and 4% of the population, although it is more prevalent in children, with up to 8% affected. Only around 20% of people who think they have a food allergy actually have one. Food allergies are much easier to test for than intolerances. 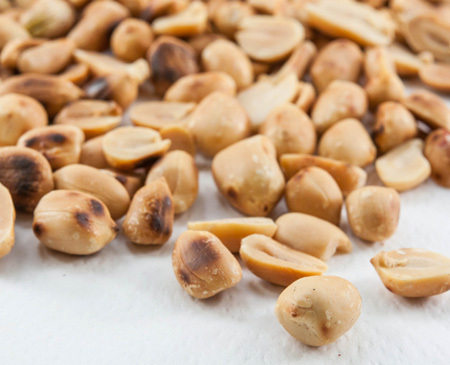 The most common food allergies are to nuts, especially peanuts, and shellfish. Other common allergies include cow’s milk (especially in children), soya and some seeds and fruits. Non-IgE mediated in which white blood cells, called T-cells, cause a slower and less severe reaction. The skin prick test: a small drop of fluid containing the allergen is placed on the skin and the skin beneath is broken with a needle. If the skin reddens and swells then an allergic reaction is confirmed. Blood tests: a small number of IgE mediated allergies can be identified by analysing the blood for the specific IgE antibodies. Elimination: non-IgE allergies can be diagnosed by the elimination of the suspected foodstuff from the diet. If the symptoms disappear, then the suspicion is confirmed. Skin prick tests can identify a wider variety of food allergies, however blood tests are much safer for people who may have a severe reaction to even a pin prick amount of the allergen. The main treatment for food allergies is identification and elimination. The food that produces the reaction is simply removed from the diet. However, in severe cases, this may not be enough to eliminate exposure. Some nut allergy sufferers are so sensitive that even trace amounts can be dangerous. In these cases, patients are advised to carry a syringe of intravenous adrenaline for use in emergencies, to check ingredient lists carefully and to wear an emergency bracelet or necklace detailing their condition. Contrary to popular belief, a reaction to gluten (wheat) is not usually food intolerance but an autoimmune digestive condition called coeliac disease (although there is a gluten intolerance called non-Coeliac gluten sensitivity or NCGS).The most common food intolerance is dairy (or lactose) intolerance. This is caused by low levels of the enzyme lactase required to break down the sugar lactose in milk and dairy products. Some people are also intolerant of food additives, such as monosodium glutamate. There are no reliable tests for food intolerance. They can be hard to diagnose as many of the symptoms, such as abdominal cramps and diarrhoea, closely resemble other digestive conditions such as IBS or inflammatory bowel disease. The only way to assess food intolerance is to rule out any underlying inflammatory bowel disease and then to eliminate different suspected foods from the diet, one by one, until the symptoms ease, then reintroduce the food to see if the symptoms return. There is no treatment for food intolerance other than the elimination of the food from the diet. However, if this includes a whole food group, such as dairy or wheat intolerance, you will need the help of a dietician to ensure that you are still getting a healthy, balanced diet that includes all the required vitamins and minerals. Dr Wilson works closely with leading dieticians and nutritionist Mary Van Der Westhuizen. Will I always be allergic or intolerant? Children will often lose allergies and intolerances as they grow older and their immune system develops. Adults may also find that their immune system changes after a year or two of eliminating the trigger food, reducing or removing their reaction. Unfortunately, this rarely applies to the harshest and most common allergic reactions like peanuts and shellfish.